Here’s part of a note I recently sent to a Dramatica user who is currently focused on the concept of Duality. Now, this note won’t make much sense if you don’t know anything about Dramatica, but you can get a pretty good crash course here at http://storymind.com/dramatica/ where you can download a free copy of the Dramatica Theory Book and learn all about the concepts behind this approach to narrative. Duality holds initial increased clarity but is a dead-end if you stop there. The quad provides all of the perspectives necessary to see any situation or feeling under study as a dynamic, rather than just two perspectives on the same thing. Two of the elements of the quad are dynamics, and two are elements. This is exactly the same as Yin and Yang. Most people see the Yin Yang symbol as just two things, male and female. But it actually has four parts: each comma-shaped area, and within each a dot. The dots are the elements, the commas are the dynamics. In a quad, mass and energy are the dots – the binary and the immediate. Space and time are the commas – the higher dimension of dynamics in which the elements exist, but are also guided by the dynamics as water might flow around a rock. Yeah, I know, pretty philosophic from someone who co-created the very definitive Dramatica chart that operates more like a Rubik’s cube. 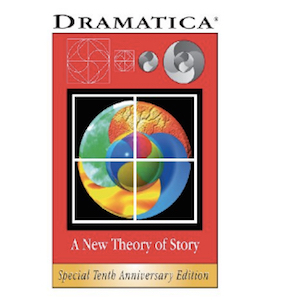 But Chris and I were always aware that the visualization we use to present Dramatica only expresses the digital side, at the expense of the additional analog truth that operates in the same space-time.